They say a picture is worth a thousand words. So imagine what a documentary is worth?! Documentaries are a great resource for learning and educating. Prison Fellowship International has an excellent Restorative Justice Online library which includes a summary of videos. I dedicate this blog to Heartspeak Productions who have produced a series of educational videos. You can listen to experts like Howard Zehr, learn about topics like trauma, watch a forum that took place, and be moved by personal stories. This summer Heartspeak, in conjunction with Fraser Region Community Justice Initiatives, released their latest work: “Restorative Justice Is The LAW”. This 48 minute film explores the common ground between restorative justice, human rights and the law. Heartspeak Productions began on top of a mountain at the end of a 14 day Peace Training in 2001. Larry Moore and Cathie Douglas decided to collaborate and started right then and there with participants of that training; interviews with renowned experts like Barry Stuart, Dave Gustafson and Liz Elliott were included in their first documentary “A Healing River”. 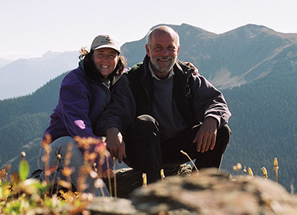 Cathie and Larry have spent the last decade learning, volunteering, doing research, and documenting the principles and practices of restorative justice. Their videos are a huge contribution, as well as a reflection of their own journey. Even when Heartspeak hasn’t received funding, they forged ahead using their own resources and turning to YouTude to make their work widely and freely available. Check out their website and YouTube channel where they have generously uploaded about 75 videos. Thanks Larry and Cathie for your contributions. Very well done documentary. Excellent history and insight with issues of the criminal justice system. Two unique and independent issues came to mind for me: (1) with Dr. Shannon Moore on Youth rights and restorative justice, and (2) with Dr. Elizabeth Elliot on the morality of general deterrence. First, Dr. Moore spoke about Canada’s ratifying the UN Convention on the rights of the child. There are three major players that have involvement with a child’s rights: parents, state, and individual. Dr. Moore discusses the importance of diverting youth away from prison, thus minimizing state control over the child. Perhaps the amount of involvement the state has over children’s rights are less arguable, but what about the balance between parents and individual? Where is the line between punishment/teaching and infringing rights? Notably, the documentary mentioned that rights cannot be granted/seized. If so does not prison restrict freedom of mobility, or hate crime restrict freedom of speech? Secondly, Dr. Elizabeth Elliot used a “Kantian” argument against general deterrence. I refer to her argument as Kantian, because she argues that using persons as a means to other persons ends is immoral? A brilliant moral argument. A utilitarian could respond saying general deterrence provides the greatest good for the majority, by preventing future persons from committing crimes, thus promoting the overall good. My point is not merely to respond, I would love to further hear the argument against deterrence from a moral stance. Thanks for another great blog, love to hear any responses and expansion on some of the ideas. The emphasis on empathy and compassion is key, keeping the parties (offender(s), victim(s), and community) involved. This does not simply mean the offender(s) empathisizing with the victim(s)/community, this means all three parties empathizing with one another.